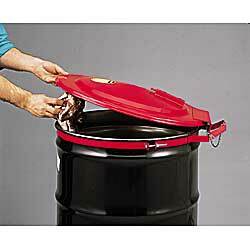 Clamps onto 22-1/2"22-3/4" dia., 55-gal. drum, creating a firesafe container. Cover automatically shuts if there is a fire in the drum when the replaceable, fusible link inside melts at 165°F. Ideal for storing combustible trash. Red powder coat paint finish. IN STOCK.